The Google Chromebook Pixel C was announced by the company in late September as its first attempt at a hybrid tablet — and the first Android-based device to join the high-end Pixel family. Both Microsoft and Apple now have hybrid devices positioned as better ways to work than a laptop. Apple recently released the iPad Pro and Microsoft has the Surface family of devices, so Google wasn’t going to be left behind. The Pixel C, the company’s first real hybrid, is its response to these competitors, but is it any good? 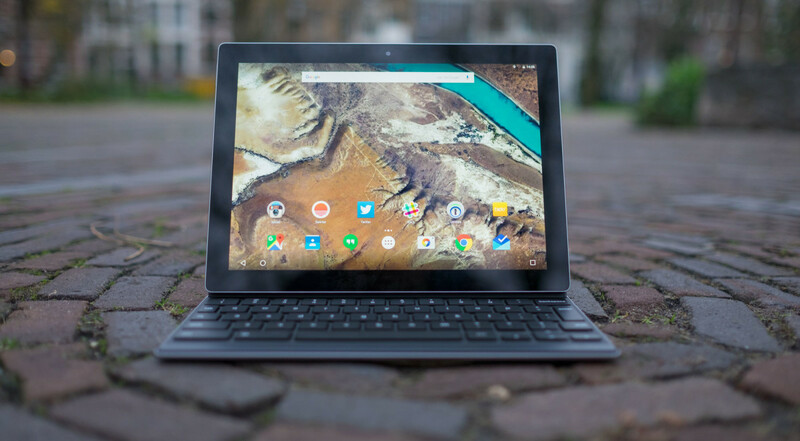 In short, the Pixel C’s design is gorgeous, particularly for an Android tablet. It’s a subtle, unassuming device, wrapped in anodized aluminum with nothing more than a camera and the Pixel line’s famous light bar on the back. It squishes a 2560 x 1800 resolution display into just 10.2-inches, which looks fantastic even in direct sunlight and incredibly crisp thanks to the high pixel density. The Pixel C feels great in your hands, with Apple-level build quality and very few blemishes ​to​ interrupt the design. The most impressive part, however, comes when you snap the keyboard accessory on. It’s magnetic rather than using hinges or contacts to attach and leverages Bluetooth to avoid any sort of docking mechanism or extra case. All you need to do is get the keyboard attachment close to the bottom of the tablet and it snaps right on with a surprisingly solid grip. You can carry it around holding only the tablet and it won’t fall off, even if it’s upside down and you shake it around a bit. It’s a nice touch, and one I much prefer to the iPad Pro’s strange keyboard-cover attachment, as this one integrates with the tablet much better. The keyboard has other smarts, too. It’s got its own battery onboard, since it uses Bluetooth and connects wirelessly, so the keyboard charges itself inductively from the tablet when it’s closed — though a full charge should last up to two months, according to Google. It is a little on the small side — you’ll feel cramped on there if you try to do any serious work for hours on end — but it’s more than enough space for getting small bursts of work done during the day. The travel on the keys is just right and is one of the best keyboards on a hybrid that I’ve used. It’s a seriously impressive first effort by Google, which feels well built. The Pixel C is incredibly light because of its small size, at 242 x 172mm. The device weighs in at just 517g and 7mm thickness without the keyboard attached and 916g / 5.5mm thick with it, which means you’ll barely feel it if it’s in your backpack. The Pixel C is an interesting device, as the Chromebook lineup has traditionally had limited appeal due the fact that you’d need to lay down $499 for a device that amounted to little more than a Web browser. Inside is an Octa-core Tegra X1 processor, an NVIDIA Maxwell GPU and 3GB of RAM — this is a serious tablet, with desktop class performance. There two options for storage; 32GB or 64GB, with no Micro-SD slot to expand it. The camera on the back is an 8-megapixel shooter and on the front you’ll find a 2-megapixel camera for video calls. On the sides there are two stereo speakers, a 3.5mm audio jack and a volume rocker, as well as a single USB-C port — used for charging — and no other places to plug anything in. This is a minimal device, and doesn’t have anything Google doesn’t think you’ll need. Usually I steer clear of talking about specifications too much, because in general they’ve become largely irrelevant to how devices run, but the Pixel C’s guts are more powerful than your average device, which shows. Thanks to those impressive guts, it’s as smooth as butter to use, and a true delight to navigate around. You won’t find any lag, nor issues running whatever you can throw at it. It’s a little disappointing Google didn’t throw in an LTE modem, but with almost every phone out there supporting tethering these days it’s likely the decision came down to battery life over functionality. Perhaps the most interesting hardware feature is the addition of four microphones along the top of the device, which Google says is so that you can say ‘OK, Google’ anywhere in a room and the Pixel C will hear you. It works pretty well, which is useful when cooking and you need to set a timer quickly or do a quick search without your hands, though it seems a little overkill. The Pixel C’s design is lovely, but things start getting weird when you realize this isn’t a Chromebook. No, it’s running Android 6.0.1 out of the box, the latest version of Google’s mobile operating system which seems like a strange choice on the surface. It’s the exact same version of Android you know from every other Google-based tablet — there are no special tweaks to make it work on a hybrid device and it’s nothing more than vanilla Android. That works well enough for most tasks, but when you start looking toward any sort of real productivity it starts falling apart. First of all, Android 6.0.1 still doesn’t ship with any sort of multi-window support, so you can only have one app on your screen at a time. It’s a glaring oversight, which makes no sense in the context of the Pixel C.
Samsung has built multi-window support into its own devices, but Google hasn’t fully embraced it yet, which is a shame. When you’re trying to get any sort of work done this is incredibly frustrating. There’s no way for you to run Slack and Twitter at the same time, or browse the Web while checking your email. It’s one app at a time, switching manually between each. With the massive screen real estate available, as well as the superpowered processor, why can’t this device multi-task properly? Even the iPad can now, so why is Google ignoring such a seemingly obvious opportunity? In particular it’s confusing, considering early development builds of Android M had primitive multi-window support. Google wouldn’t say why it didn’t include the feature, but it’s likely down to timing. It seems inevitable that multi-window support is on the horizon for the Pixel C, but with the holiday season looming it probably wasn’t ready in time for the device to ship. Still, that’s a huge blemish on a device that’s supposed to be going up against both the iPad Pro and Surface Pro 4 — even Apple has split-screen support now. The rest of Android on the Pixel C works great — there are plenty of tablet optimized apps on the Play Store which work well, with notable exceptions (cough, Twitter, cough). There are some oddities that come with the special √2 aspect ratio touted by the Pixel C, such as slightly misaligned icons on the homescreen, though in general it works well for the size of the screen. One small, but notable difference is that the home, back and multitasking buttons have been separated and placed on the far left and right of the screen for easy access when using the keyboard attachment. Typing on the keyboard is lovely and perfectly comfortable — I wrote this entire review on the Pixel C — so you’re able to touch-type even though it’s cramped into a smaller form factor. I was pleasantly surprised to see the Pixel C handling the keyboard with minimal screwing around. The on-screen keyboard disappears whenever it’s connected and a physical button on the keyboard pops it back up if there’s no hardware key for the function you need. When you snap off the keyboard, it instantly recognizes that it has been disconnected and switches mode. Perhaps the strangest thing to become accustomed to is no touchpad on the keyboard dock, which the Surface Pro trained me to expect. I was constantly grabbing around for it before realizing I was actually only on a tablet. That’s not the end of the world, though it is odd needing to reach to the screen every time you need to do something. There is Bluetooth mouse support, which I used for some time, but Android is still disappointingly bad at dealing with a pointer on screen and doesn’t support scrolling, so you’re constantly clicking and dragging around. Most appealing to me is the 10-inch size — it’s light and small enough to throw in a backpack and almost not realize it’s there, which is great for travelling and going to meetings. I’d happily replace my Macbook with the Pixel C for all-day use at conferences or when traveling… if it wasn’t restricted by having only one app in focus at a time. That’s a deal breaker for me, and turns it into a device I’m more likely to only use around the house than anything else. What I can’t quite figure out about the Pixel C is who exactly it’s being made for. Were there people really searching for an Android-based productivity tablet? Sure, the Pixel C’s $499 price point is a little lower than the Surface Pro’s we-put-an-entire-computer-in-a-tablet price of $899, but it’s not clear who this device is targeted at. It does have some big benefits versus the iPad Pro in terms of being used as a productivity device, however. You get multi-user support out of the box, so you can have one of these laying around at home or in the office and let anyone pick it up to use their own apps and accounts without giving them access to all of your own stuff. It’s also a lot more convenient to carry around than an iPad Pro, with a smaller keyboard and 2” smaller screen, but with no way to multi-task and a lack of proper pointer support, it’s left somewhere in-between Apple and Microsoft’s products. While the Surface Pro can run full Windows apps and be used as a desktop workstation, it lacks a great app ecosystem on the tablet side. On Apple’s side of the fence iPad Pro is a lot larger and that keyboard attachment is frankly, not great. The Pixel C could have been well positioned to compete in-between the two, but it needs more time. Google says software improvements will come every six weeks, but that’s no consolation if you’re buying today. Android’s biggest fans will probably love the Pixel C, but I can’t quite figure it out. It’s a fantastically built device with great potential, but it’s truly let down on the software side and doesn’t really have a comfortable niche right now. There are few meaningful tweaks to Android that make it easier to use as a real productivity machine, which is perplexing. Many of us expected Android 6.1 to ship with the device with multi-window support and other tweaks for the Pixel C in tow, but it’s nowhere to be seen. Given a few months, the Pixel C might be a real competitor to the iPad Pro or Surface Pro, but right now it feels like it’s just another Android tablet with an identity crisis. Well…. maybe. The Pixel C is an impressive first hybrid tablet for Google, but it feels like it’s not yet finished. Without true support on the software side, particularly for real multi-tasking, the Pixel C feels limited for serious work. It’s probably my favorite ultra-portable tablet for throwing into a backpack and carrying around all day because it’s the perfect shape and size, but for many I suspect the software may be a deal-breaker. That said, I’m more likely to get this when that feature eventually becomes available over an iPad Pro, because it’s cheaper and far more portable, with a more appealing keyboard. Unfortunately Android isn’t fully up to the task right now, but it’s Google’s first stab at a hybrid so it’s likely it’ll improve with software updates in quick succession. If anything, the Pixel C is a glimpse of a future where Chrome OS eventually goes away, with Android as the preferred platform for all of Google’s form factors. It makes sense long term, and seems like Google’s first real signal that the two might eventually become one. The Pixel C is on sale from today starting at $499/€499, but you’ll need to purchase the keyboard attachment for an additional $149.